Founder and Chairman of YogaCAN Joel Waltzer has announced the sponsors for YogaCAN 2019: Practice Yoga, Yoga Lab, Yoga House, Naples Beach Hotel, Naples Grande Golf Club, City Mattress, M Waterfront Grill, Coastal Beverage, Intellus Financial Advisors, and PG Fine Wines. Support from these sponsors assists with the facilitation of the annual YogaCAN event, whose proceeds benefit local families through the Cancer Alliance of Naples. YogaCAN studio sponsors from Practice Yoga, Yoga Lab, and Yoga House will co-teach the yoga class on Sunday, April 28th, guiding participants in a Vinyasa flow. The yoga class will take place at Naples Beach Hotel on their beachfront lawn; the hotel has generously hosted the yoga portion of this event for the past four years. Similarly, the Naples Grande Golf Club has hosted the Sunset Social portion of the evening, with food and beverages provided by M Waterfront Grill and Coastal Beverage. “We are thrilled to have the support of these local sponsors. YogaCAN is proud to raise money for the Cancer Alliance of Naples for the sixth year in a row, and these sponsors allow us to continue executing this event year after year. We’re particularly grateful for the sponsors who support us annually – their participation provides a meaningful consistency to the event,” says Waltzer. Bidding on high end golf and sport experiences is live at charitybuzz.com by searching Cancer Alliance of Naples and will continue through Monday, March 25. Current auction items through CharityBuzz include tickets to meet the Miami Marlins owner with four premium tickets to a Marlins home game with dinner in the club, golf threesomes at various renowned golf courses in the country, including Calusa Pines in Naples, Florida, Winged Food Golf Club in Westchester, New York, Muirfield Village Golf Club in Dublin, Ohio,and Maidstone Golf Club in East Hampton, New York. The main auction will begin on April 1 at GiveSmart.com with items appealing to a wider audience. Additional items will be offered during YogaCAN 2019 on April 28th. 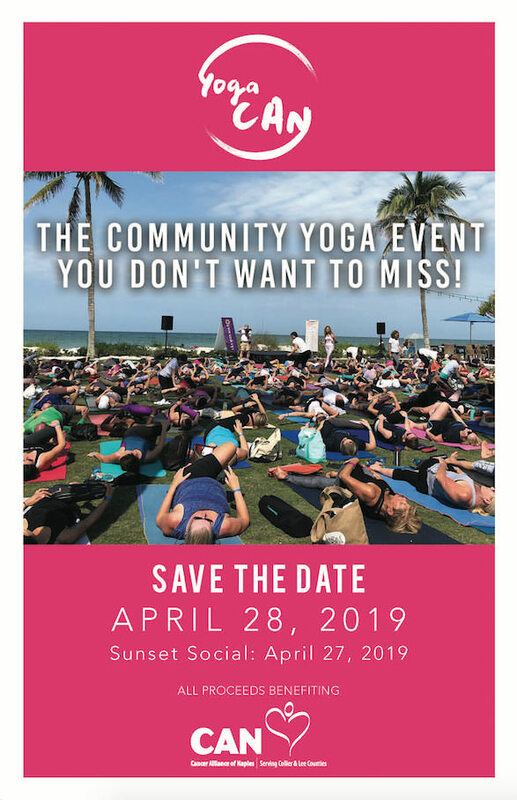 YogaCAN 2019 begins on Saturday, April 27th with the Sunset Social, an evening of celebration, socializing and fundraising for the Cancer Alliance of Naples. The Sunset Social caters to a wide variety of attendees, allowing non-yoga participants to show their support for the cause. YogaCAN is hosted on Sunday, April 28th at the Naples Beach Hotel, and will be followed by a live auction and fresh food and beverages supplied by several local restaurants and caterers. A kid’s yoga class will be offered simultaneously to the main event with supervision and fun activities for younger ages. YogaCAN is a rain or shine event; in the case of poor weather, yoga will be held in a ballroom at the Naples Beach Hotel. Joel Waltzer founded YogaCAN five years ago after losing his wife Jane to breast cancer. Beginning as JaneCAN, the event was originally created as an opportunity for family, friends, and community to support Jane and raise money for the Cancer Alliance of Naples. Following Jane’s passing, her legacy lives on through the annual YogaCAN event. Since its beginning in 2014, YogaCAN has raised over $300,000 for local families in need of financial assistance during cancer treatment. YogaCAN 2019 is in search of additional sponsorships and auction items. If you or your company would like to sponsor the event or donate an auction item, please contact lisa@naplespowerplate.com or jtmole@me.com. For more information about YogaCAN, visit https://www.yogacan.org/. For more information about the Cancer Alliance of Naples, visit https://cancerallianceofnaples.com/ or call 239-643-4673.